SEATTLE -- Austin Dillinger sat disappointed after the shelter worker took the dog, Leo, back to his cage. 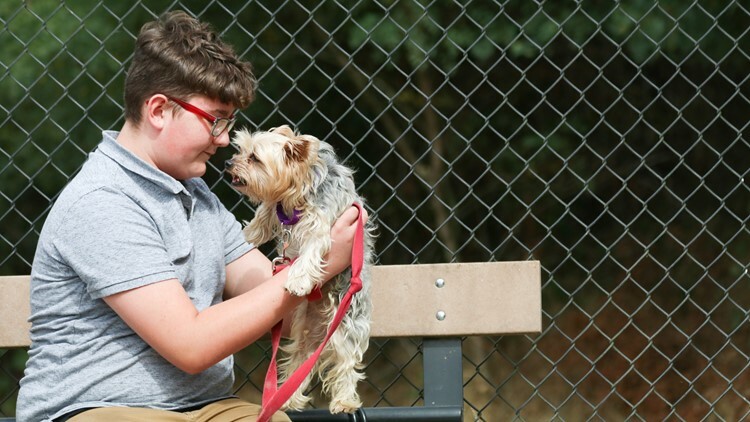 As the 14-year-old frowned, he stuck his finger through another cage, greeting a stray black lab he wasn't allowed to walk. 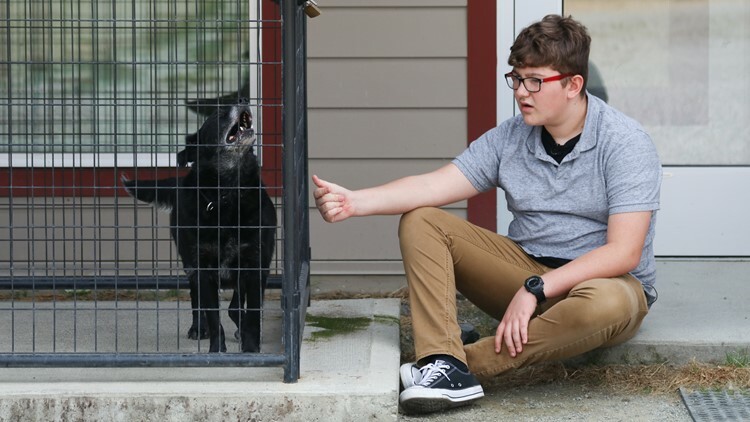 "Dogs have the same issue as me," said the Yakima County teen. 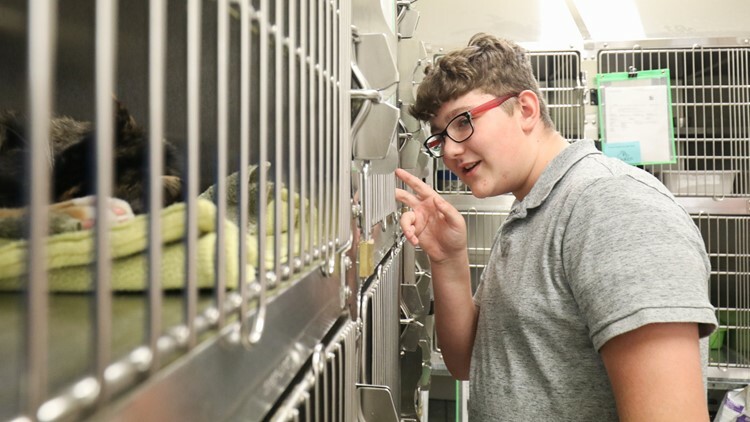 Spending time at the dog shelter is one of Austin's favorite hobbies because he says he can relate to how the pets feel in their cages: punished and unwanted for reasons they cannot control. School is where the high school freshman, who has autism, ADHD, anxiety disorder and disruptive behavior disorder, said he feels the most lonely -- like he doesn't belong. Throughout middle school, Yakima School District officials kicked Austin out of school for more than 100 days, labeling the teen as a troublemaker instead of as a student who needs and has a legal right to an individualized education and support under the federal Individuals with Disabilities Education Act (IDEA). Dozens of behavior reports written by his middle school teachers described an obstinate student who was hellbent on causing chaos in the classroom with his emotional, explosive outbursts. Austin showed "willful non-compliance," "a refusal to follow directions" and a "refusal to participate," his teacher wrote. "I felt like I was one of the worst kids that ever was because they were just constantly sending me home," Austin said. But the issue, special education experts and medical professionals say, is that Austin didn't choose to break the school rules. 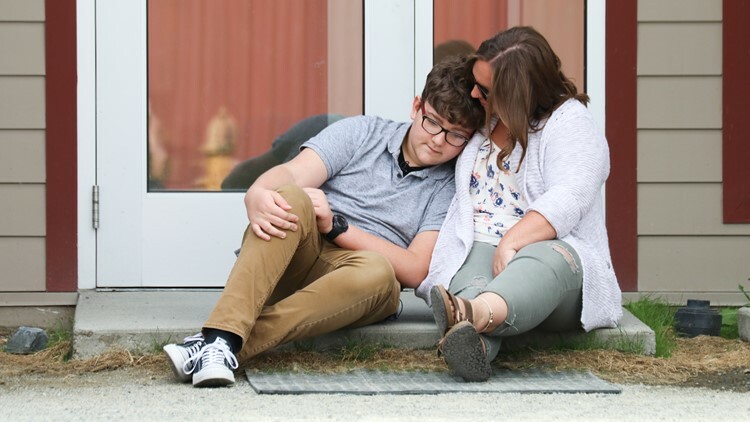 He's one of thousands of Washington students with special needs who are repeatedly punished in school for behaviors directly caused by their disabilities. "It was just so difficult to get the school district to understand that he wasn't just a naughty kid," said Christina Madison, Austin's mom. "It didn't matter what kind of medical rebuttal I had to defend him. They weren't buying it." A KING 5 investigation found that experiences like Austin's are widespread across Washington state, where students with special needs are routinely disciplined more than twice as often as their non-disabled peers. In 2017, Washington schools suspended or expelled students with disabilities nearly two-and-a-half times the rate of students without disabilities, according to a KING 5 analysis of data tracked by the state's Office of Superintendent of Public Instruction (OSPI). 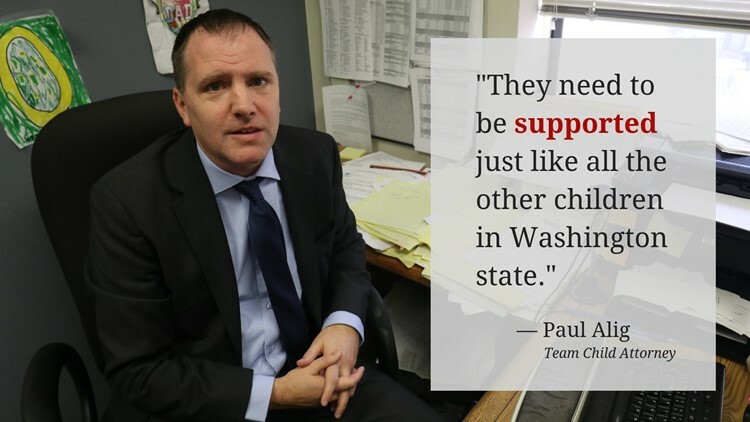 "Schools are supposed to figure out what resources to give the kids instead of punishing them for their disability," said Paul Alig, an attorney at Team Child, a Washington-based nonprofit law office that advocates for youth in order to prevent disciplinary removals from school. "Students with disabilities need more education services -- not less." The school districts that wrongfully discipline those students not only violate the federal IDEA, but also the state's anti-discrimination law. It's OSPI's duty to make sure districts aren't discriminating against students with disabilities but the school districts face little to no consequences when they do. The state education agency has the authority to penalize school districts through actions, like withholding funds, if a district violates the discrimination laws. But a public records request to OSPI revealed the agency has never exercised that power. Nationally, Washington has one of the worst track records for excessive suspensions and expulsions of special education students. For decades, the state's schools have opted to get rid of the problem with control and punishment, as opposed to using evidence-based tactics to prevent escalated outbursts in the first place. "The old default of kicking them out and turning that into long-term suspension has not served anybody well," said Superintendent Chris Reykdal, the state's top education official. Only nine states -- including North Carolina, Missouri and West Virginia -- kick more students with disabilities out of school, per student, than Washington, according to an analysis of the U.S. Department of Education's most recent IDEA report to Congress published in 2017. The federal data, which tracked suspensions and expulsions during the 2013-2014 school year that lasted longer than 10 days, found that Washington suspended or expelled 135 students per every 10,000 kids. For context, Oregon suspended or expelled 41 special education students per 10,000. Idaho suspended or expelled four special education students per 10,000. Special education experts and attorneys who represent families impacted by excessive school discipline say the data tracked by OSPI and the federal government doesn't provide a complete picture of the problem. They say the numbers don't account for the countless instances of unofficial disciplinary action, such as when school administrators ask parents to pick their children up early or keep them home from school. It's a reality Madison, Austin's mom, said she knows too well. The 34-year-old single mom, who worked at a doctor's office at the time, said school officials contacted her repeatedly in the middle of the work day to complain about her son's behavior. "I started getting phone calls. I got e-mails, 'Austin is not behaving himself.' 'Austin did this,' and it was just exhausting," Madison said. "It got to the point where the more I wanted to understand what happened, the more irritated they would get with me, and (they) just wanted me to come pick him up and deal with it." To an outsider, Austin can easily blend in with his non-disabled peers. He loves to play video games, kayak, bike and build things. He dreams of becoming an engineer for Apple some day. He's verbal and capable of high academic performance, according to his previous assessments. 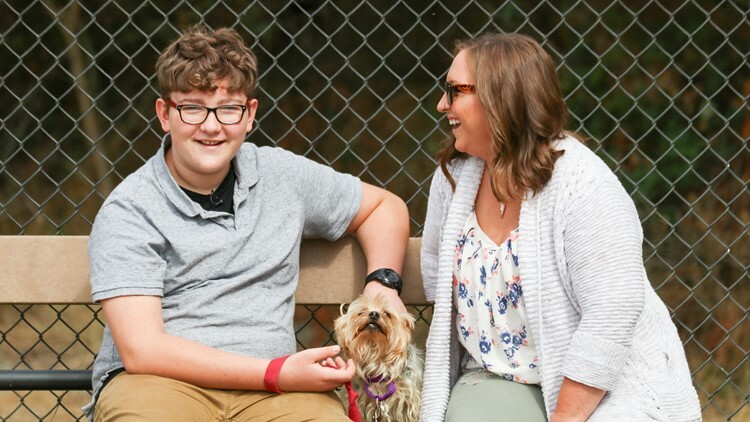 But Austin's disabilities cause the 14-year-old to often misperceive social situations and process language differently than his typical peers, according to medical professionals. "In my opinion, Austin has behavior that appears at times to be under control, but is in fact due to miscommunication with brain structures responsible for modulating responses to perceived threat," wrote George Petzinger, a doctor who evaluated him in 2016. "He misunderstands the social meanings of words and actions of other children and adults." That often leads to blurting and escalating outbursts, which have -- in the past -- included aggression, according to school discipline reports. Sometimes, the teenager shuts down. "You might have a situation where Austin is in the class and he sees some kids off giggling. Well, you and I might look at that and be like, 'Why are they messing around in class?' and Austin might totally read into that and think they're laughing at him. So, he'll get mad," Madison said. '"Austin is totally aware that he has this challenge," she added. "So if you can sit with him and catch these moments with him, and you can read his facial expression...and help him sort through those feelings, he is completely compliant and comes to terms with reality so easily." Madison said administrators at Austin's school told her they did not have the resources to provide him with a one-on-one aide or positive behavior intervention. Instead, his Yakima middle school excluded him from class for 107 days, which added up to 22 weeks of missed school, according to a KING 5 analysis of three-years worth of Austin's detailed attendance records. "They convinced themselves that they could fix him behaviorally, and they were not willing to listen to expert opinions," Madison said. In February 2017, school administrators suspended Austin for four days for an outburst that began after he wouldn't lift his head off his desk. In November 2016, the school suspended Austin for 15 days for an incident that escalated after he talked during "quiet time" and ignored the school principal. "When an event like that occurs, schools should slow down and work with families to identify what may be triggering those behaviors and the best solutions for preventing or responding to them," said Alig, the Team Child attorney. The Yakima School District declined to answer questions about Austin's case, the school district's discipline policies and the special education training resources available to its staff. All the missed school took a toll on Austin's performance. Academic assessments show the teen is whip smart. In 4th grade, he was reading at a 10th grade level. Yet, his middle school report cards were loaded with Ds and Fs. "What we're seeing is that a lot of these kids basically give up," said Eunice Cho, an attorney at the American Civil Liberties Union (ACLU). "They're being told that they're not worth of an education -- that they're not worth teaching, that it's not worth it for them to learn." Austin said it was hard to not give up after constantly falling so far behind in class. "When I'm at home, I literally have like missed assignments piling up and piling up and piling up," Austin said, recalling that he had 98 missed assignments in 7th grade due to his absence. "I hate missing school... it makes even more stress, and it just gets so much harder, and I'll snap, and it will make things worse." Education experts and attorneys who represent students with disabilities say the cycle of suspensions and expulsions can cause long-term problems for students with special needs. They say those kids who are repeatedly kicked out of school have an increased chance of not graduating from high school and dropping out of school entering the criminal justice system. Researchers, contracted by the U.S. Department of Education, reported in 2010 that students who are expelled or suspended are up to 10 times more likely to drop out of high school. It's a correlation cited in a 2014 report to President Barack Obama, published by My Brother's Keeper Task Force. "I can't think of another word other than tragic," Alig said. "They miss out on so much from their education experience when they are not in school. These are the building blocks to help students with disabilities learn how to get a job and keep a job and learn how to live independently and safely. These are our future members of society who are going to be contributing in a positive way, and they need to be supported just like all the other children in Washington state." Washington has a history of not being being able to keep students with disabilities in school. According to the Department of Education's most recent report to Congress — the same report that tracked state-by-state suspension and expulsion rates — 34 percent of the state's special ed kids are dropping out. Only two states in the country, Utah and South Carolina, report a higher dropout rate. Only 58 percent of Washington special education students got diplomas in 2016. A 50-state analysis of graduation rates reported to the U.S. Department of Education shows that just 12 states, including Alaska, Georgia and South Carolina, graduated fewer kids with learning disabilities than Washington that year. Reykdal, OSPI's superintendent, admits that the state has had outdated discipline policies for years, and changing that culture isn't easy. "We're talking about having our entire teaching core re-think what it means to have a disability," he said. "It's the hardest thing we do here is transforming the existing teaching profession into new behaviors, but that's our job." In 2016, OSPI began the process of re-writing the state's student discipline rules, which were first adopted over four decades ago. In July 2018, the agency adopted a new set of rules, which are designed to minimize the use of exclusionary discipline practices in public schools and increase opportunities for students, families and community members to be engaged in discipline-related policies and resolutions. Starting in the 2019-2020 school year, the new rules will require school districts to eliminate any zero-tolerance approaches that require a mandatory suspension or expulsion. The rules will also require schools to classify sending a student home early or requesting a student stay at home as a suspension. Washington advocates and attorneys who support kids with special needs say the discipline rules are an important step in addressing the problem. But the root of the problem, they say, is that the state's special education system is underfunded by millions of dollars. It leaves many students with disabilities in limbo, without an adequate education. And it leaves many teachers without the resources and training they need to support their special education students. "That is the status quo across the state -- that we are not given access to high quality professional development on special education and disabilities," said Shannon McCann, a middle school special education teacher and the president of the Federal Way Education Association. "As a teacher, you try to do everything you possibly can. You try everything you know. But is it really your fault that those strategies are not in your toolbox because you've never had the opportunity to learn them? Rob Lutz, a high school history teacher in the Evergreen School District, agrees that a lack of resources is to blame. He said many teachers don't have the extra support in class to appropriately address behavioral issues that stem from a student's disability, so it becomes a "juggling act," which leads some teachers to remove the special education student from class to minimize disruption to others. "How do you balance the needs of the entire class with the needs of an individual student whose needs are not being met at that point?" he said. "The quick fix is to do something right now. That kid is acting out. I have 30 other kids in the class, and I have to continue to teach them. It's not the right fix. It doesn't solve the problem. But it solves the immediate need right there." Both McCann and Lutz said the situation frustrates them because they know firsthand that students with disabilities can flourish when given the right support. "I have full faith that no matter how impacted a student is, they can be successful in a public school that is well-funded. Since starting his freshman year at Eisenhower High School, Austin has had no disciplinary action related to behavior, his mom said. Austin is also a named plaintiff in the ACLU's ongoing class action lawsuit against OSPI. The civil rights advocacy group alleges that the state's education agency has not done enough to hold school districts accountable for the excessive discipline of special education students. OSPI's special education director, Glenna Gallo, wrote in a statement that the agency has been "proactively engaged in addressing exclusionary discipline for years," including adopting the new discipline rules in July 2018. "When a parent does not agree with the school supports, OSPI provides opportunities for mediation, complaint investigation or a formal hearing from an independent hearing officer," she wrote. In addition to joining the ACLU's class-action lawsuit, Madison said she's filed a legal complaint against the Yakima School District. But she said she worries that the school system's previous failures have already damaged her son's self-worth, opportunities and future. "Every moment missed could have been something that inspired him to do something later in his life that he might have no interest in now because he wasn't given the opportunity," Madison said. "It makes me feel helpless. I'm doing everything I can to try to fight it, but I can't change the past. It's already done." Know your rights. The Office of Superintendent of Public Instruction offers guidance for families, which includes a handbook with information about you and your child's rights under state and federal law. If you have questions about the special education process or difficulties communicating with your school district and need additional help, OSPI has special education parent liaisons available to assist you. The state also has education ombuds who work with families to answer questions and help resolve concerns. Contact their office online or by phone at 866-297-2597. This story is the seventh part of "Back Of The Class," a multi-part investigation into the state of special education in Washington. The series exposes the reasons why Washington lags behind much of the country in serving one of our most vulnerable populations: students with learning disabilities. Susannah Frame is the Chief Investigative Reporter at KING 5. Her stories have exposed many wrongs, leading to changes in public policy, congressional investigations, federal indictments and new state laws. Follow her on Twitter @SFrameK5 and like her on Facebook to keep up with her reporting. For story tips or questions, e-mail her at sframe@king5.com. Taylor Mirfendereski is a multimedia journalist, who focuses on in-depth reports and investigations for KING 5's digital platforms. Follow her on Twitter @TaylorMirf and like her on Facebook to keep up with her reporting. For story tips or questions, e-mail her at tmirfendereski@king5.com.